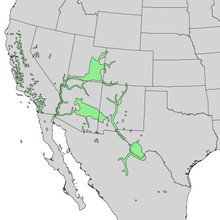 Populus fremontii, commonly known as Fremont's cottonwood or the Alamo cottonwood, is a cottonwood (and thus a poplar) native to riparian zones of the Southwestern United States and northern through central Mexico. It is one of three species in Populus sect. Aigeiros. The tree was named after 19th century American explorer and pathfinder John C. Frémont. P. fremontii is a large tree growing from 12–35 m (39–115 ft) in height with a wide crown, with a trunk up to 1.5 m (4.9 ft) in diameter. The bark is smooth when young, becoming deeply fissured with whitish cracked bark on old trees. P. fremontii is cultivated as an ornamental tree and riparian zone restoration tree. It is used in planting for: wildlife food and shelter habitats and ecological restoration; larger native plant and wildlife gardens and natural landscaping projects,  windbreaks, erosion control, and shade for recreation facilities, parks, and livestock. ^ a b "Populus fremontii". Germplasm Resources Information Network (GRIN). Agricultural Research Service (ARS), United States Department of Agriculture (USDA). Retrieved December 16, 2017. 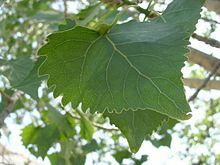 ^ "Populus fremontii (Fremont's cottonwood)". USDA Plants Profile. ^ a b c d e "Populus fremontii subsp. fremontii". Jepson Manual. University of California Press. 1993. 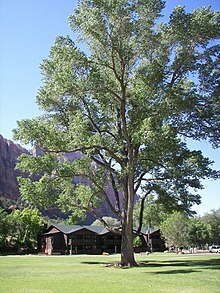 ^ "Populus fremontii (Fremont cottonwood)". Calflora Database. ^ "USDA Plant Fact Sheet" (PDF). United States Department of Agriculture. Retrieved February 5, 2002. ^ "Range Plants of Utah". Utah State University. ^ "Populus fremontii ssp. fremontii". American Forests. Archived from the original on 2016-02-07. ^ a b c Eckenwalder, J.E. (1977). "North American cottonwoods (Populus, Salicaceae) of sections Abaso and Aigeiros". Journal of the Arnold Arboretum. 58 (3): 193–208. ^ "Digital Desert: Mojave Desert". MojaveDesert.net. n.d.
^ Padgett, Kenneth. "Kachina Dolls". Guide to Hopi Kachina (katsina) Dolls. Retrieved September 8, 2015.